BNP Paribas Cardif, the joint venture partner in SBI Life Insurance, has sold 9.2 per cent of its stake in the private life insurance company for Rs 4,751 crore. This is one of the largest insurance deals in the country since 2016, when the first insurance company got listed. “CA Emerald Investments has acquired 90 million shares of SBI Life Insurance, representing 9 per cent of the total issued and paid-up share capital of the target company as of March 1, 2019,” said CA Emerald Investments. "Carlyle's trust in the company will further strengthen our resolve to enhance our leadership position in India's life insurance industry through a single-minded focus on quality customer experience", said Sanjeev Nautiyal, MD & CEO of SBI Life Insurance. Sunil Kaul, MD of the Carlyle Asia buyout advisory team, said: "SBI Life, led by a strong management team, is helping deliver this promise in the life insurance space and is well positioned to further benefit from industry trends. We are excited about the company's growth prospects." However, on average, with a sale price of Rs 515.01 a piece, the stake was sold at an 11.3 per cent discount to Thursday's closing price of Rs 580.50. This is also lower than SBI Life's IPO price. The insurance company had come out with an IPO in September 2017 at Rs 700 a share. The shares of SBI Life Insurance dipped 12 per cent to Rs 510 on the BSE in intra-day trade on Friday, after over 9 per cent stake in the company changed hands through block deals. 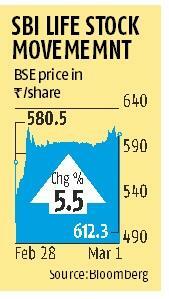 However, it recovered quickly and closed at Rs 612.25, up 5.47 per cent from its previous day's close. Similarly, other listed life insurance companies such as ICICI Prudential Life Insurance and HDFC Life Insurance also closed 0.97 per cent and 3.04 per cent, respectively, above their previous day's close. Listed life insurance companies' stocks have been under some pressure in the past couple of months because of company-specific concerns. But, analysts are of the opinion that with profitability expected to rise, their earnings prospects look better. Due to market volatility, the ULIP sales of the life insurance companies have taken a hit and companies are focusing more on pure protection business, which will boost their margins. 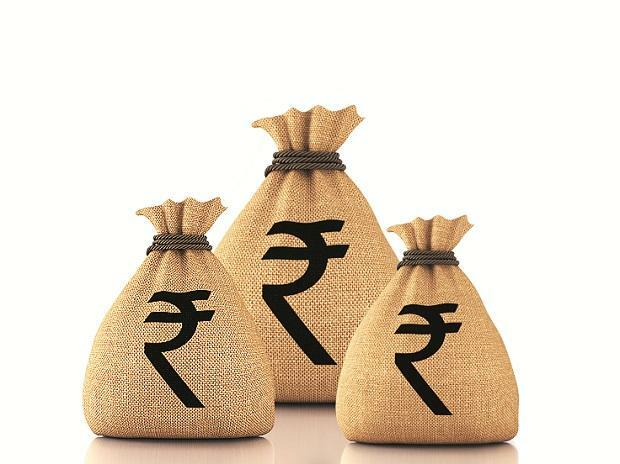 The protection mix of SBI Life is 11 per cent on the value of new business, while that of HDFC Life and ICICI Prudential Life is 16.6 per cent and 8.63 per cent, respectively, on annual premium equivalent (APE). SBI Life reported a net profit of Rs 870 crore in the first nine months of FY19, up 13 per cent over the corresponding period of FY18. Also, the new business premium of the life insurer was up 32 per cent year-on-year from Rs 7,200 crore to Rs 9,470 crore in the nine months of this financial year.